The International Diabetes Federation (IDF) is an umbrella organisation of more than 200 national diabetes associations from 160 countries. The World Diabetes Congress is one of the world's largest health-related congresses, and last year attracted 15,100 delegates from 172 nations, 300 journalists and 1,500 speakers - its highest number of speakers ever. Selected for the first time for the event, the Middle East/North Africa region has seen an explosion in type two diabetes: the UAE has the second-highest prevalence of diabetes globally, with one in five suffering from the disease. The IDF's legacy strategy focused on how the congress would boost initiatives and encourage governments in the region to respond. Dubai, the UAE's second-largest city, met the IDF's requirements with its safe metro system and range of accommodation. The perception of Dubai as a luxury tourist destination was a potential problem. Also, due to new regulations that govern practices in the pharmaceutical industry, IDF's industry partners faced difficulties justifying their support of congress attendees in Dubai. "We overcame delegates' preconceptions with a consistent communication plan on why we chose Dubai," says IDF congress manager Celina Renner. "We highlighted the significance of diabetes to the region; the affordable hotel accommodation; the convenient transport system; the capacity and reputation of the congress centre, and the geographic location, which provided the perfect opportunity for IDF to add a strong political dimension and increase the representation of government and civil society at the congress." The 2011 gathering took place at an important juncture for diabetes, which may have contributed to a record-breaking attendance. Renner explains: "The event followed shortly after the UN Summit in September and continued the momentum from this pivotal high-level meeting. It took the outcomes from the summit and put them to government representatives at the congress at the new high-profile Global Diabetes Forum." The IDF also secured free metro travel passes for all delegates. Attendance was up 20 per cent on the previous IDF congress, held in 2009 in Montreal. There was also record exhibition and sponsorship sales. Renner says: "The IDF wants to improve the experience in the future through technology, such as a custom-made app that includes all scientific content, webcasts, abstracts, speaker biographies, a searchable programme feature and communication tools for delegates. "We also want to individualise the on-site offer for delegates by printing personal CME certificates, for example, as well as improving the workshops and providing more interactive sessions." 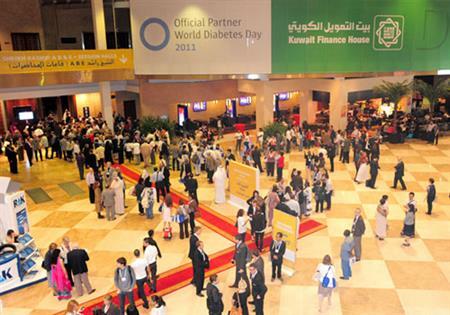 4 December 2011: Global Diabetes Forum and opening ceremony.